Ok - bread - another one of my guilty pleasures (I have a few if you can't tell). 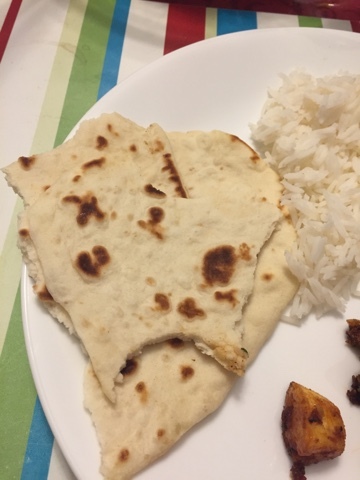 I've never been sure of Naan bread - exactly what it is. But if you haven't had it before it is a relatively soft bread that is flat. Surprisingly I didn't think Naan would have yeast in it because of the flat nature of the bread. The recipe was rather straight forward to make and easy - the trick was not guessing myself on the consistency that the dough would have when I started working with it out of the bowl. I would normally start my bread dough in my Kitchen Aid Mixer - however this one I used a fork and fingers to work with it to start. I likely would oil my hands a little next before starting to make the dough as it was a lot more sticky than bread dough when I started to work with it. I was again very thankful this night to have the help of my wonderful bestie - Serina. Given the time of day that we were making food I need help just to fry the bread (I ended up cleaning the kitchen first before cooking - including cleaning out the fridge while we try to come up with a plan of attack for the evening meal.) In any event we kept the naan plain for this adventure. However, my next challenge will be to be stuff the naan bread with cheese and maybe so some with garlic and basil butter *yum*. 1 cup whole milk, hand hot. Pour the flour into a large mixing bowl. Make a well in the middle and add 2 tablespoons of oil, the yogurt, yeast, sugar, salt and baking powder. Mix through with your fingers until the ingredients resemble breadcrumbs, then add the warm milk, little by little, and mix again until it comes together into a dough. Put the dough on a clean and well-floured surface. The dough will very sticky at first, soft but robust, knead for around 5 minutes. Rub 1 tsp of oil all over the ball of dough. Transfer the dough to a bowl in which it can double in size. Cover it using a tea towel or plastic wrap and leave it in a warm place for at least an hour. When the dough has doubled in size, divide into 12 pieces. Take one piece, roll it into a ball, and flatten between your palms. Coat it fresh flour and roll it out to around 5 x 8 inches. Put a frying pan on a medium to high heat, and when it's hot, place the naan in it. When the naan starts to bubble - after 20 - 30 seconds - flip it over, using a spatula and cook the other side for the same amount of time, checking regularly to ensure it doesn't learn. Flip over again and quickly press it gently all over with a spatula for 010-15 seconds. Turn the naan over again for another 10 to 15 seconds, check that there are no uncooked doughy bits, then take off the stove. Keep any cooked naan warm by stacking them onto of each other on a plate or wrapping them in foil, then repeat with the rest of the dough.